United States foreign policy is too often centered around militarized violent responses to conflicts across the world. But this doesn’t have to be the case. Peacebuilding efforts are more cost effective, have higher success rates, and ultimately save significantly more lives. And yet, the Trump administration has proposed to cut funding to the State Department and the U.S. Agency for International Development (USAID), two major institutions that support peacebuilding and diplomatic problem solving, by 37% in their proposed Fiscal Year 2018 (FY18) budget. On February 28, the Office of Management and Budget submitted private FY18 budget guidance to all administrative departments and agencies. Reports indicate that the budget level for the State Department and USAID will be cut 37% from FY17 levels, and possibly much more for foreign assistance. As the State Department and USAID face these extreme and lethal cuts, the budget guidance suggests that the Pentagon budget will increase by $54 million while most other government agencies will face only a 15% decrease. The 37% cut is not only draconian, but also a disproportionate blow to peaceful diplomacy efforts. But what does this budget cut actually mean? The proposed budget would strip America’s civilian forces back to funding levels not seen since 9/11. Given the severity of complex global threats including the proliferation of terrorist groups such as ISIS, al Qaeda, and Boko Haram; the emergence of lethal diseases including Ebola and Zika; and various international conflicts leading to the biggest refugee crisis since World War II, these cuts would not only be an American divestment from peace efforts, but also could cause thousands of deaths across the globe. These extreme and inappropriate budget cuts will not only affect our foreign policy, but will be unthinkably dangerous for America’s national security. The cuts would decrease the capacity of diplomats and peacebuilding efforts across the world, allowing more space for violent extremism, and leading to significant negative shifts in diplomatic relationships with countries across the world. Additionally, a divestment from diplomatic solutions would lead to an increase in conflict as well as the number of American men and women in uniform put in mortal danger on the battlefield. We must not attempt to save money when it would put American lives at risk. While there is always room for positive reform within government agencies, these budget cuts go far beyond what the United States should be willing to risk. These budget cuts would roll back significant reforms undertaken since 9/11, including progress made on human trafficking, the rights of women and girls, trade and energy in Africa, wildlife trafficking, and many others, all of which have had strong bipartisan support. They would be a hacksaw to the civilian side of our national security budget, which is critical to keeping our country safe. The State Department and other civilian agencies, including USAID, have played significant roles in bipartisan peacebuilding efforts including in mass atrocity prevention, as well as the work of the J Bureau and the Bureau of Conflict and Stabilization Operations. With these budget cuts, critical structures and resources would be put under severe stress, with unimaginable results for civilian populations worldwide. Francesca Freeman is a STAND alumna, and served as STAND’s National Student Director for the 2015-2016 school year. Francesca holds a B.A. 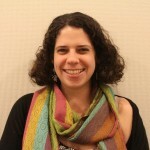 from the University of Chicago, and is a Program Assistant at the Social Science Research Council. You can follow Francesca on twitter at @francescafree16. Written on the base of the Statue of Liberty, this quote reflects one of the most fundamental of American values: openness to those yearning to be free from the chains that bind them. With 21.3 million refugees worldwide, the highest number since the 1940s, it is essential that the United States recommit to these ideals by welcoming refugees of all religions and nationalities. Today, on Holocaust Remembrance Day, President Trump is readying himself to sign an Executive Order to halt refugee resettlement and ban visas for people from Muslim-majority countries including Syria, Iraq, Iran, Sudan, Libya, Somalia, and Yemen – effectively a ban on Muslims. Infographic from the White House archives. Widespread fear of refugees is grounded in prejudice and ignorance. Refugees undergo the most heavily-scrutinized screening process of any group allowed entry into the US. Unlike European nations, in order to protect the American people from any serious security threat, the United States screens all refugees for 18-24 months before they even set foot on US soil. As of September 2015, 23,092 Syrian refugees were referred to the US Refugees Admission Program, with 7,014 interviewed by the Department of Homeland Security since 2011, and 2,034 admitted to the United States. Zero Syrian refugees resettled in the United States have been arrested or removed on terrorism charges. While the refugee resettlement program can never be completely risk-free, there is a thorough 9-step vetting process already in place that ensures refugees are as low risk as possible before they are admitted. In the United States, we embrace diversity, whether it be diversity of religion, race, nationality, culture, or identity. We value that which makes us different because we know that our differences make us stronger. Throughout history, refugees have made significant contributions to American history and culture. In fact, Madeleine Albright, the first female US Secretary of State, came to the United States as a refugee when she was 11. Former Secretary of State Henry Kissinger came to the United States as a refugee in 1938, fleeing Nazi persecution. Albert Einstein, the author of the theory of relativity, as well as countless other findings and inventions, came to the United States as a refugee in 1933. The acceptance of refugees in the past has not only helped shape America into the country it is today, it has also shaped my life in profound ways. I am descended from two families of refugees, both coming to this continent in different times but for strikingly similar reasons. My dad’s family came to the United States on the Mayflower. The Puritans came to the United States in search of a place where they could practice their religion and their belief system without threats from surrounding communities. They wanted a better life for their children, and their children’s children–and if you multiply that process about 17 times, they came to this new land so that I could live the life I’m living today. My mom’s family came to the United States much more recently. My family came to the United States preceding the Holocaust to escape the pogroms that swept across Europe in the early 1900s. 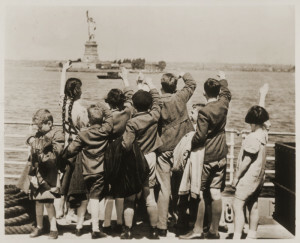 My grandma’s family was resettled into the Lower East Side of New York City by HIAS, one of the major refugee resettlement organizations that still operates today. Now, I too live on the Lower East Side, just blocks from where my family resettled generations ago. Perhaps most striking, though, is the part of my family that came desperately to the United States as refugees and were turned away, forced to return to Europe and, ultimately, to be killed. When my family arrived in Boston, it was discovered that my great, great aunt Rachel had tuberculosis, and she was forbidden from entering the country. Officials forced her to return to her home in Eastern Europe. While in the hospital after her return, Rachel wrote letters to my family regularly. But one day, the letters stopped coming, and they never heard from her again. It was later discovered that around the same time the Nazis had invaded the town where my great, great aunt Rachel lived. We can only assume that she was taken by the Nazis and killed in a concentration camp. Her name is not in Yad Vashem’s Shoah Victims’ Names Database, and we do not know where she lived her last days or where she died. She only lives on in our memories. My great, great aunt Rachel represents a whole slice of the world that will never exist. She could have had children, made great discoveries, or devoted herself to improving her community. But instead she was turned away, and the unrealized potential of a precious human life was lost. The United States has made significant mistakes in the past, but we must always strive to be a stronger, more welcoming, and more loving nation. We must support those who need it most, and in doing so, we will allow our country to flourish and grow in new ways—ways that will truly make America great. This Thursday, troops loyal to South Sudan President Salva Kiir, and soldiers loyal to Vice President Riek Machar, clashed in South Sudan’s capital, Juba. This confrontation sparked the worst violence the country has seen in months. While there is no official death toll, at least five soldiers died on Thursday and 272 people, including at least 33 civilians, were killed on Friday. Some claims estimate that more than 300 people were killed during the first five days of violence. The killings stopped on Saturday, when South Sudan celebrated its fifth anniversary of independence from Sudan, but flared back up on Sunday and Monday. Witnesses reported heavy artillery fire at the UN base in Juba, helicopter gunships in the sky, and tanks roving the streets. Some reported soldiers in uniform looting in Jebel Market, the largest market in the city. Approximately 1,000 internally displaced people have fled to another protected location due to fighting near the UNMISS compound. Chaos continues as people attempt to piece together who started and who escalated the violence, what the actual death toll is, and what can be done to bring peace. However, the renewed violence has created concerns of a return to the all-out civil war that has plagued South Sudan for the better part of its short history as an independent country. Concerns of violence are deeply rooted in South Sudan’s conflict-ridden history. In December 2013, President Salva Kiir accused Vice President Riek Machar of plotting a coup, to which Machar responded by forming his own oppositional army. This led to violence that spread across the country outward from Juba. While the fighting is largely based on tensions between political elites, Kiir has used ethnic affiliation to mobilize the Dinka ethnic group. Similarly, Machar has used his ethnic identity to mobilize the Nuer. Today, many speculate that President Kiir and Vice President Machar have lost control of their troops, leaving the future of South Sudan uncertain. The international community is taking the threats seriously, although no foreign entity has taken action to stop the violence. The United States is evacuating non-emergency staff from its embassy in South Sudan and the State Department has stated that the security situation in Juba has faced a “sudden and serious deterioration.” As of today, the U.S. has also deployed 40 Marine Corps troops to protect the U.S. Embassy in Juba. Japan has also dispatched military aircraft to evacuate Japanese nationals. After a closed-door meeting in New York on Sunday, the United Nations Security Council called on Kiir and Machar to control their respective forces, prevent the spread of violence, and genuinely commit themselves to the implementation of the ceasefire and peace agreement. Monday evening, the clashes ceased after leadership from both sides called for an end to the fighting. The tenuous ceasefire seems to be holding, although future security and stability in South Sudan is far from guaranteed. We love our graduated MC Seniors! As we prepare to welcome the new Managing Committee to DC for our annual August retreat, we wanted to take a moment to thank the AMAZING seniors from the 2014-2015 STAND Managing Committee for the amazing work they have done! Equal parts leader, comedian, politician, slogan-generator, and creative spark – I can’t imagine what STAND would look like without Zach. Although he had been through the STAND leadership cycle a few times by the time I met him, Zach was as passionate about human rights and genocide prevention as anyone I’ve met to date. I learned a lot about leadership from the way you showed genuine interest in any conversation and the way you made yourself super approachable to STAND newcomers. Beyond the memes you inspired, beyond the times you helped me ensure we would only get two hours of sleep before important STAND meetings, and beyond the nights you joined me in bombarding a weary Connor with truth or dare questions, I am most thankful for you encouraging me to speak up and share my voice. I am sure you will be a star among the already impressive STAND alum pantheon, and I’m still waiting to get the call back about my application to be your campaign manager. I met Heather the first night of the STAND MC retreat! At first she seemed quiet, but then we got on the subject of STAND, genocide, and youth activism, and I don’t think she’s stopped talking since then! Heather alway amazes me with her wealth of impressive knowledge about all of STAND’s conflict areas and her ability to pull out a statistic, article, or story about anything related to genocide and mass atrocities just from memory. Few people could stay as passionate as she is about such a tough topic, but she knew how to stay motivated and keep the rest of us motivated too! Heather was also incredibly dedicated to her chapters and was constantly telling us how proud of them she was. Her dedication to helping them however she could was an inspiration to the rest of us! It’s always great to meet someone who is so smart with such similar interests, but it’s not every day you find someone who also has a dedication to including everyone and teaching others what she knows. I will miss our late-night chats about genocide and racism and MC won’t be the same without you, Heather, but I am so glad you’ll be doing such great work in your new job!! What does freedom mean to Darfurian refugees? This post was written by Francesca Freeman, STAND’s new Midwest Regional Organizer for the 2014-2015 school year. Francesca is a rising senior at the University of Chicago. This past year I created and worked on “The Freedom Project” in which high schools and colleges across the country created installations where people could display their answer to the question: “What does freedom mean to you?” At my school, we created a large poster and tabled every day for a week, talking with people about the importance of freedom in their lives and in the world. Through i-ACT, I had the opportunity to share this question with some of our Darfurian refugee friends living in a refugee camp in Chad. Although the love of freedom in America is truly amazing, we must never stop working towards a more complete freedom for everybody both in the United States and across the world. It is time for the United States to step up to this idealized version of itself and completely embody it. We must continue to work for a world in which all of Iggy’s words become a reality.